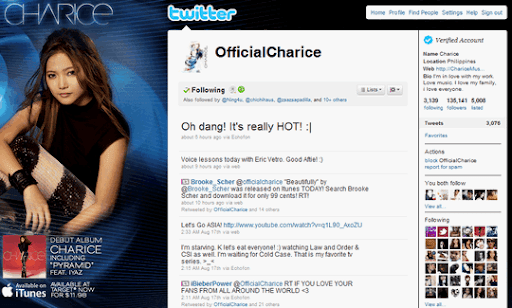 @OfficialCharice is the official and verified Twitter account of Charice. As of August 19, 2010 - 12:18 PM, Charice has a total of 136,122 followers on the social networking site and is following 3,136 tweeps including Miss Oprah Winfrey, Miss Karen Davila and Mr. Sam Milby. TRIVIA: To describe the voice of Charice, Mr. Ryan Murphy - Executive Music Producer of the hit US TV series Glee once said, "When that girl opens her mouth, angels fly out." PS: Watch Charice sing the Philippine National Anthem via the link.